We’ve said it before and we’ll say it again: we dislike labels. BUT when it comes to skin types, they do provide a solid framework when it comes to skincare. Dry, oily, combination? You probably identify with one of these skin types, but keep in mind that your skin is definitely more nuanced than that, so it’s important to choose the right keystone for your routine: the cleanser. So let’s explore some skin types, shall we? Side effects may include tight, dry, easily irritated skin. It can sometimes be oily due to the skin’s overproduction of oil to make up for lack of moisture. Hyaluronic Acid is a universal moisturizer: great for all types! Skin naturally produces hyaluronic acid, but it is broken down by day to day skin stressors (pollution, sun, etc), so adding extra hyaluronic acid is a no-brainer. Ceramides: We’ve written about ceramides before, but here’s a quick TL;DR: Ceramides are lipids (fats) that bind the skin together, retain moisture, and prevent aging. Side effects may include oil on the skin, breakouts, clogged pores. Benzoyl peroxide may be a tad drying (which is why it’s known mostly for spot treatment), but in small doses for those with oily skin, it makes a great cleansing ingredient for these same properties. Kaolin clay is absorbing, exfoliating, but also very gentle. Side effects may include areas of dry and oily skin neighboring each other. And just as there are skin types, there are cleanser types, too. Gel, oil, foaming, balms – it can get overwhelming, but we are here for you. Here’s a brief review of all the cleanser types out there. Think of it as Cleansing 101: Class is now in session. Is it right for me? Cleansing oils are a good skincare pick for anyone with dry, combination, and even oily skin if the oil emulsifies (break down with water), but if it doesn’t, those with oily skin should avoid as it will leave an extra layer of oil on the skin. This cult favorite contains vitamin E and olive oil to break down makeup and daily grime. It emulsifies beautifully and will leave your skin moisturized. This one is great for skin that’s on the dryer side. The French be knowing. This cleansing oil contains castor oil, grapeseed oil, and sweet almond oil (all non-comedogenic) for a soothing, gentle cleanse. This oil is perfect for all skin types, dry, combination, and oily. This cleansing oil is formulated without any of that nasty stuff (SLS, parabens, etc), and is another pick that’s great for all skin types. It contains sunflower, safflower, and grape seed oils to clarify and nourish the skin. Cleansing balms are almost the same concept as cleansing oils: the oil latches on to sebum and makeup and emulsifies with water. The only difference is the texture. Balms melt into oil from a solid texture once they make contact with the skin. Is it right for me? It is! Once again, depending on the formulation and emulsifiers, cleansing balms are good for all skin types. Cleansing oils that are heavy in coconut oil may be too heavy and pore-clogging for those with oily skin. This French-Korean brand has some amazing formulations, and this balm is no exception. It contains coconut oil and sunflower oil, and no mineral oils of any kind, leaving your skin feeling clean, but hydrated. This one takes a bit to work into the skin, but its benefits are hard to ignore. It contains Vitamin C to reduce uneven skin tone, and cranberry seed oil brightens. This one gets a bonus point because it can also double as a nourishing mask! Is it right for me? Micellar waters are effective makeup removers that come in a variety of formulations for specific skin concerns, but it is particularly good for dry, sensitive skin as it is hydrating and won’t mess with your skin’s delicate pH. A classic for a reason. Formulated with fatty-acid micelles, this micellar water removes makeup, dirt and oil without stripping the skin, leaving it hydrated and cleansed. This option is great for all skin types. This cleansing water is best for oily to combination skin because it contains lactic acid to gently exfoliate while it cleanses. It is formulated with mineral-rich water from Japan, lavender, and rosemary. Truly a spa water. This is a clean formulation without any oil or alcohol, and contains a soothing mushroom and antioxidant blend to protect the skin against pollution. Is it right for me? If you suffer from sensitive, dry skin, cream cleansers are your ultimate cleansing option. If you’d like to dabble with a cream cleanse if you have oily or combination skin, it can’t hurt, but you may feel a bit too “hydrated” for your liking. Meant to be used on dry skin, rubbed in and left for a moment and then wiped off with gauze, Lait U contains wheat germ extract (for fatty acids) and sweet almond oil (for its calming and antibacterial properties). If you know Biologique Recherche, this product is one of their less offensive smelling products. This cream cleanser contains all sorts of ultra-hydrating ingredients like aloe vera, avocado, and macadamia and rosehip seed oils. Plus it’s clean and organic so you can feel good about replenishing your dry skin. Another no-rinse hydrating option, Avene’s cleanser contains hyaluronic acid, vitamin E and thermal water to soothe and plump the skin. It’s hypoallergenic so this is a good option for those with sensitive, dry skin. Is it right for me? Luckily for us, there are a bevy of wipes on the market that target different skin concerns. If you do have sensitive or acne-prone skin, rubbing your skin with the wipe may cause irritation. Biodegradable, good for sensitive skin, and under $10–what more could you want? This formulation is the same as its water-form counterpart and attracts dirt and makeup. These wipes are good for all skin types and the environment (a portion of the sale goes towards saving the polar bears!) with jojoba oil, vitamin E and aloe vera extracts. Formulated for super sensitive skin, Klorane’s wipes have soothing blue cornflower, castor oil and vitamin E.
Is it right for me? Gel cleansers are best for those with oily to combination skin, as they may be too stripping for dry skin types. This is a good one if you’re looking to explore gel cleansers. It’s on the gentler side with its low pH and botanical extracts. Papaya and grapefruit enzymes gently exfoliate, remove excess oil and brighten the skin. This formulation is best for oily and combination skin types. This gel cleanser contains kale, spinach and green tea that add nutrients, fatty acids and antioxidants respectively. This one suits dry, combination and oily skin types. Is it right for me? 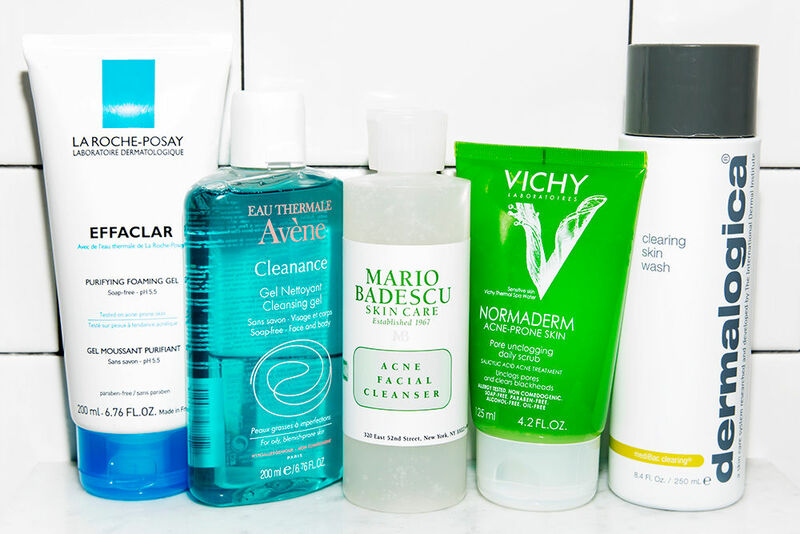 If you have oily, acne-prone skin, foaming cleansers are definitely the right pick for you. They get rid of excess sebum and leave skin feeling refreshed. This foaming cleanser doesn’t use any sulfates to get that satisfying texture so cleanse away! This has vitamin C and antioxidants to brighten the skin, and it’s super gentle, so even sensitive skin types can use it. Here’s a foaming cleanser even those with dry skin can love! This one is also free from SLS so it won’t strip the skin. Wormwood extract prevents breakouts, soapberry detoxifies and vitamin C brightens. A note: think of the environment and only use natural (like sugar) and water-soluble exfoliants. Is it right for me? If you have oily to combination skin that is not sensitive, go for it, but only 1-2 times a week maximum. Tatcha’s Rice Powders (they have several options for different skin types) are a gentle way to exfoliate. When mixed with water, the powder transforms into an ultra-fine exfoliant that isn’t abrasive in the slightest. Fresh’s formulation uses brown sugar and strawberry seeds as its exfoliants. They gently buff the skin while brightening with vitamin C and hydrating with plum seed and grape seed oils. This is a pricey one, but worth it. This is formulated with Hungarian Moore mud, microalgae and fruit extracts to purify and brighten the skin. The exfoliant on this is very subtle, so it’s not damaging to the skin’s surface. Your average run-of-the-mill bar of soap should never be used on your face (think Dove, Irish Spring, etc) because they are highly stripping and drying due to their lower pH. However, there are bars out there specifically formulated for the delicate skin on your face. Is it right for me? Bars are best for those with oily to combination skin due to their foaming quality. A combination of thermal mud and bamboo powder gently exfoliate and remove oil and buildup. This bar is best for oily to combination skin. This bar is great for dry skin as it moisturizes with vitamin E, olive and coconut oils, while pink clay gently draws out impurities. The bar for everyone! This bar delivers essential moisture via fatty acids and promotes cell turnover. This one is great for all skin types, hurrah! Want to see if your cleanser is right for your skin goals? Find out on RateYourRoutine.com! Are Bleached Cotton Pads Bad For Your Skin? Are These Trending Products Worth It?